Commissioned somewhere in the region of Zero Two Hundred and Thirty Six, year One Ninety One of the Thirty First Millennium for Lord Captain Thesus Vain, who was the original holder of the Warrant of Trade now held by Sebastian York. The Cleansing Light saw active service in its mission to bring the light of the Emperor to the benighted masses, operating primarily as a long-range military scout. Of its triumphs and eventual downfall little is known beyond the fact that it was active in the Calyx Expanse during the final years before it became the Calaxis Sector, where it crashed into a small moon. There it lay, broken and abandoned until found by Cymbry and dug out by the work force funded by Sebastian. 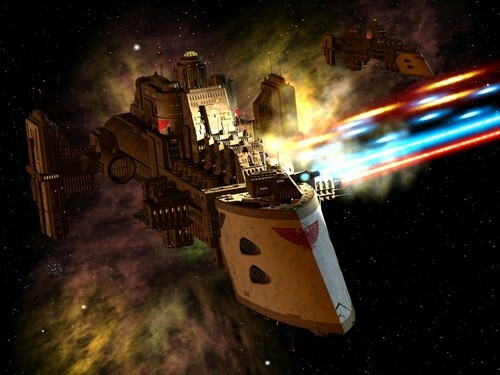 In its second maiden voyage it was badly damaged by Ork Freebooters when one of their number put his Chopper through a vital piece of machinery, thereby either allowing or directly causing a major Warp incursion. Ever since, its habits during Warp travel might politely be described as "erratic". Designed to beam the light of the Imperium out into the void, the dome itself is capable of displaying an array of symbols and designs on both its internal and external surfaces. It is, however, also directly networked into the Imperium Mantle, and the showy display systems play a role in the Cleansing Light's stealth options. Built along the dorsal ridge of the Cleansing Light, the Arboretum runs into the Observation dome and contains several artificial hot springs as well as an amphitheatre beneath the centre-point of the dome itself. Many of the less public sections are given over to food-production and life support functions, though the whole area is zealously guarded by teams and families of full-time gardeners and horticulturalists. Though thoroughly cleaned up and repaired after the Ork and Warp incursions, the Engine Room is still a source of tension and conflict thanks to the temperamental and unpredictable nature of the Warp drives. There is only a comparatively small amount of space for cargo in the Cleansing Light, with so much of the vessel's space given over to weaponry and the archaeotech relic systems. As luxurious as might be expected for a Rogue Trader vessel, these are currently occupied by a troupe of twelve dancing girls presented to Sebastian at the recommissioning party. Though no longer slaves, they are still in the process of recuperating from their time aboard the Chains of Dusk. Fitted with auto-loaders and a Zayth pattern Macrocannon the gunnery decks of the Cleansing light are near unique for an Imperial vessel. A luxurious dinning room capable of seating a dozen officers and used by Sebastian to hold meetings of the bridge officers when he has important matters to discuss with them. There is a small area set aside for musicians to perform during dinners as entertainment. Used to keep dangerous artifacts and trophies. Once it held the 'personal effects of a God of War' now it holds a Traitor space marine corpse in full battle armour, his Bolter and power sword as well as a book of daemonolgy and an amethyst blade said to contain a warp entity of some kind.